Tired of using your game controller to watch Blu-ray movies? 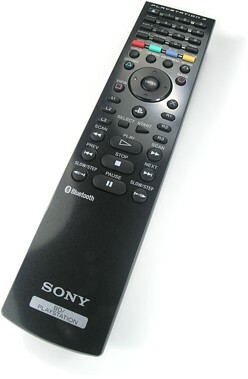 Sony’s Bluetooth remote control is the only full-featured solution. f you’re reading this, then chances are you own a Sony PlayStation 3. And, if you do, this means you’re already aware that it’s far more than just a next generation video game console. Concealed under that curved glossy black exterior is a veritable home entertainment hub, capable of performing a wide range of activities. Thanks to advanced hardware including the seven-core Cell processor, the PS3 can double as a music player, photo viewer, streaming media client, web browser and yes, even a Blu-ray Disc movie player. In fact, for some folks the console’s Blu-ray playback feature is the primary reason for purchase. Not only is it one of the more economical players on the market, but it has the highest likelihood of being kept up-to-date during its lifespan thanks to easy (and so far frequent) firmware upgrades. Sony isn’t oblivious to this “alternate” use of the PS3, and has indeed encouraged it through heavy marketing touting those specific capabilities. But despite the PS3’s intentions of being a home theater jack-of-all-trades, there is one major oversight to its design that makes this a difficult goal to accomplish: it simply isn’t friendly with existing remote control solutions. Back when the PS2 was first released, one of its primary secondary features was DVD movie playback, a particularly good deal for consumers since DVD players were still relatively expensive at the time. But the one thing movie aficionados everywhere noticed when they popped in that first movie was that there was no easy way to control the console from the couch. Only the wired game controller, draped across the floor like a technological tether, could be used to pause, rewind or navigate menus. This could not stand! Soon enough Sony too agreed that wasn’t exactly ideal, and offered a simple add-on infrared remote control kit. The bundle came with a many-buttoned infrared remote control and a small IR receiver module that plugged into one of the PS2’s available controller ports. 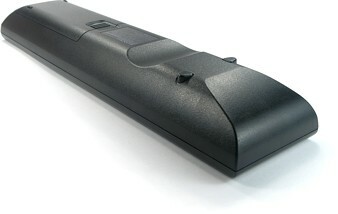 Eventually, when the company economized the PS2 into the newer slim design, the infrared receiver was integrated directly into the unit so new owners need only buy a straightforward off-the-shelf remote to add on full wireless movie control. It seemed that Sony had learned from the PS2, as when the PSP handheld system came out it already had a built-in IR port (and, even as of the time of writing this review, not much use for it). So the awe-inspiring, does-everything PlayStation 3 must surely include an infrared port for use with simple remote controls, right? As hard as the first PlayStation 3 owners looked over their prized new possessions, there simply was no infrared port in sight. But the unit has wireless Bluetooth controllers, right? True, and those are certainly ideal for playing games, but they leave something to be desired when it comes to movie watching. With few buttons, short overall battery life and no appropriate command labels, the game controller isn’t close to being an intuitive way for any member of the family to enjoy a movie. But the PlayStation 3 marketers have come up with a solution, officially dubbed the Sony PlayStation 3 Blu-ray Disc Remote Control and otherwise known as model CECHZR1U. I guess brevity and simplicity are mutually exclusive. With an MSRP of $24.99 USD the remote is reasonably priced, although not inexpensive considering that it’s a single-device product.